On the phone with his agent, an old man’s mind wanders to his youth. The shadows of WWI stretched across Europe and Russia, but it’s in these dark times that the now-aged painter met a beautiful writer. Falling in love with her was like flying. This couple, artist Marc Chagall and writer Bella Rosenfeld, survived the war, travelled the world, and made art. Life wasn’t always easy, but their devotion to each other was steadfast. Kneehigh’s distinctive approach to storytelling turns their tale into a visual and emotional feast that pays homage to the great artist, his muse and enduring love. Precise choreography of angular leans and intimate lifts against a backdrop of geometric colour fosters intimacy and effectively captures the pure joy of falling in love. Even when they fight, the love between them is ever present. Chagall often painted himself and Bella flying, and whilst there’s no aerial work in this show, the suggestion of flying is cleverly embedded into the choreography. Marc Antolin and Daisy Maywood are a tender pair as Marc and Bella. They have an easy and convincing chemistry that is utterly charming – the kind that makes your belly go all warm and soft. As this is primarily a love story rather than an examination of the artist, the dynamic between the performers is crucial to get right. They nail it. Though the hardship of war and life with the same person for decades underscores the conflicts that occur, this story is an effective snapshot of an era but it’s also a timeless one. Striking yet simple design and skilfully executed choreography support Daniel Jamieson’s fluid and concise script, and the production elements work together with ease to tug the heartstrings and soothe the soul. 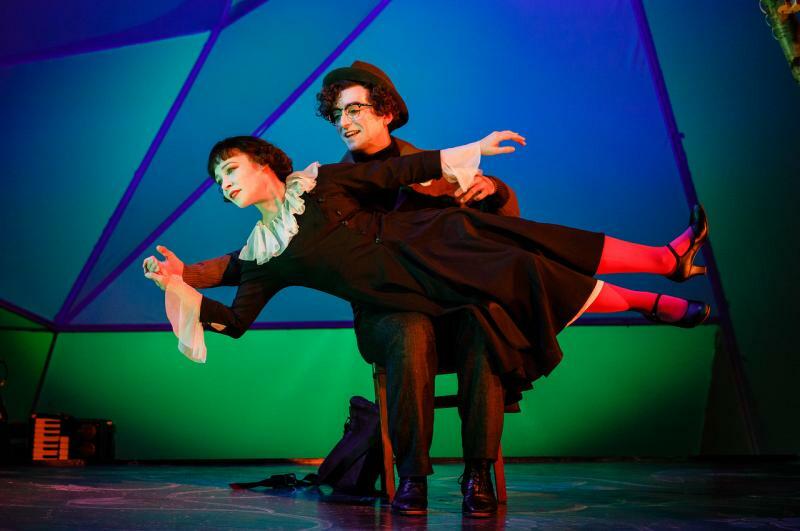 The Flying Lovers of Vitebsk runs through 10 February then tours.